This past week has been quite a citrus-y week. First lemon curd and now blood orange marmalade. But living in Italy it’s quite normal to eat and cook with citrus in the winter months. You find trucks from the south of Italy parked on the side of all the roads selling their oranges and clementines. The men who sell these fruits have such a thick southern accent that I sometimes have a hard time deciphering what they’re saying to me and I do a lot of smiling and nodding. But the oranges that they sell are so delicious. Full of flavour, not too acidic and sometimes so sweet. 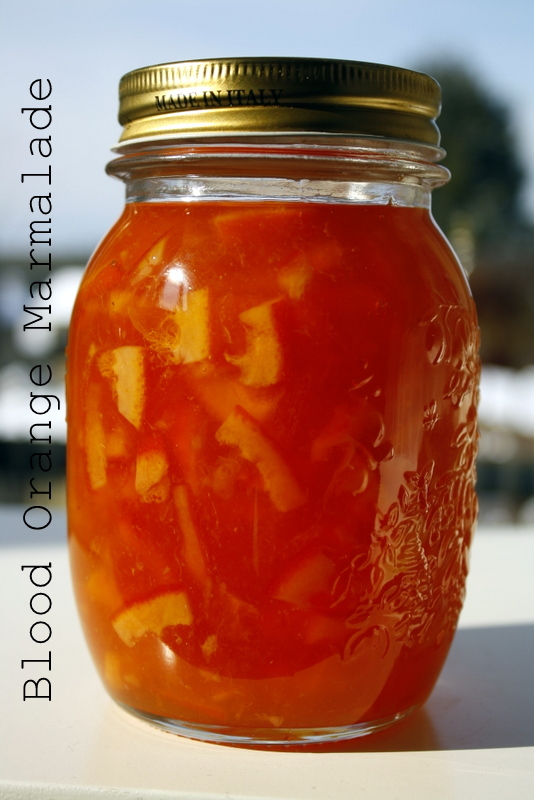 I found a recipe for Orange Marmalade in an old Martha Stewart magazine from years ago. I altered it a little by adding more chopped rind, less sugar and by using blood oranges (Tarocco) instead of normal oranges. Apparently these Tarocco oranges are packed full of antioxidents, vitamin c, folate, calcium and dietary fibre. But I’m thinking all that good stuff is wiped out by the truckload of sugar the marmalade recipe calls for. But it is oh so tasty. 1. Rinse oranges under hot water. Cut orange in 8 wedges lengthwise. Slice these wedges very thinly crosswise (to get little triangle shaped pieces). 2. Over medium-high heat bring orange slices, orange juice, lemon juice and 6 cups of water to a boil in large heavy bottomed pan (Le Creuset pots are perfect for this). Reduce heat to medium-low and simmer for 1 1/2 hours. The oranges slices should become slightly translucent and tender. 3. Stir in sugar and bring mixture to a boil over medium-high heat. Stir constantly until sugar is dissolved. Continue cooking (skimming foam from surface) until mixture reads approx. 220 on a candy thermometer (about 15 minutes). If you see mixture is still runny cook a further 5-10 minutes until syrupy. 4. Let cool and transfer to an airtight container or sterilized bottles. Enjoy! My mum has made raspberry jam with fresh raspberries from the garden every year for as long as I can remember and your post brings it all back. You’re welcome! I’m definitely not an expert on jam making but this one actually worked out…and it’s edible. Give the recipe a try…it’s easy! Pleaseeeeee – save a bottle for my visit. It looks fantastic.